The term OHV in general means OverHead Valve, or valves are installed in the cylinder head. 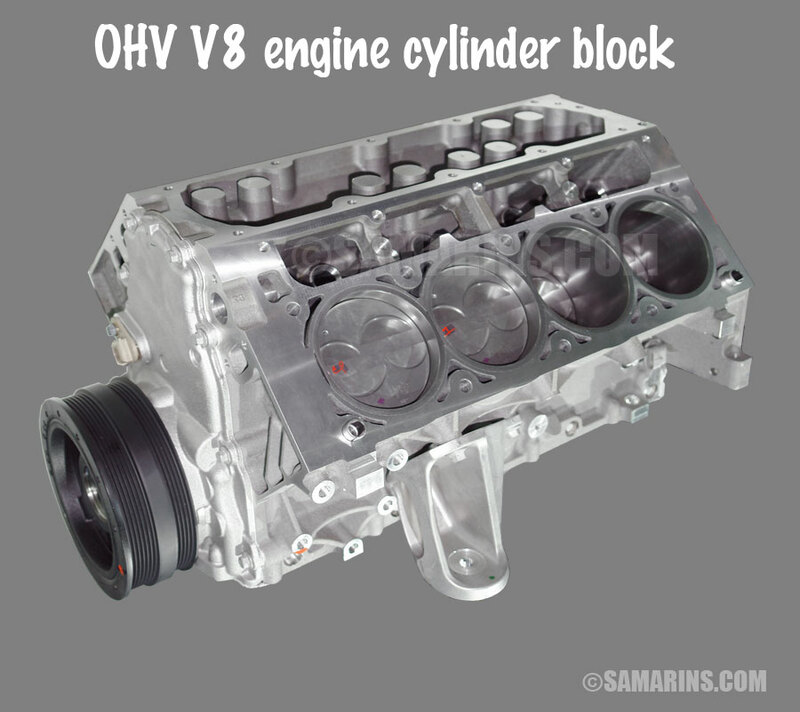 Often the term "OHV" is used to describe the engine design where the camshaft is installed inside the engine block, and valves are operated through lifters, pushrods and rocker arms. See the illustrations of OHV engine components. This design is also known as the "Pushrod" engine. The OHV design has been successfully used for decades. The main disadvantage of an OHV design is that it's difficult to precisely control the valve timing at high rpm. The reason for that is the higher inertia caused by a larger number of valve train components (lifter-pushrod-rocker arm). This means, that an OHV design is better suited for V8 or larger engines, where large engine volume offers higher torque at lower rpms. 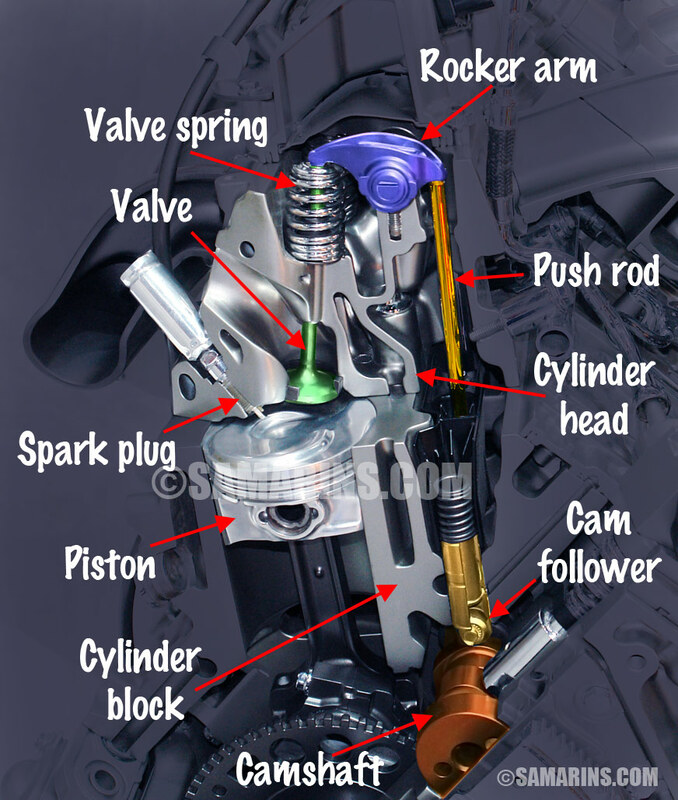 It's also technically more difficult to implement Variable Valve Timing or install more than two valves per cylinder, something that could be easily done in a DOHC engine, see the diagram below. 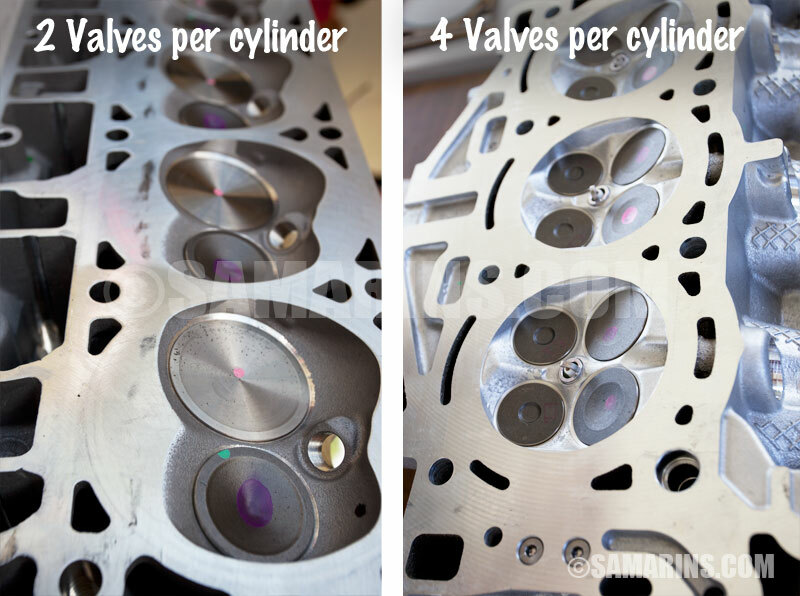 See this photo of a 2-valve and 4-valve cylinder heads. Advantages of an OHV engine include lower cost, proven durability, low-end torque and compact size. For example, the 2018 Chevrolet Corvette Z06 is 4.4 inches shorter than 2018 Honda Civic sedan. 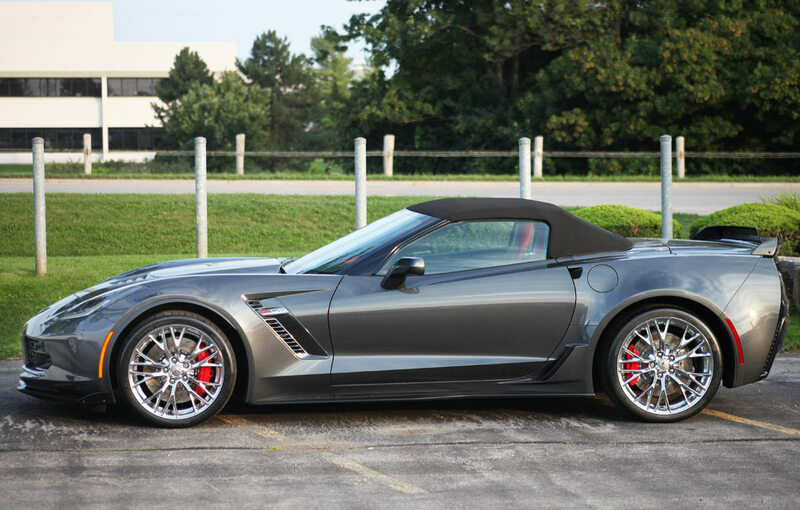 Yet, thanks to its compact 6.2L V8 OHV engine, the Corvette Z06 can go from 0 to 60 mph in 2.9 seconds. 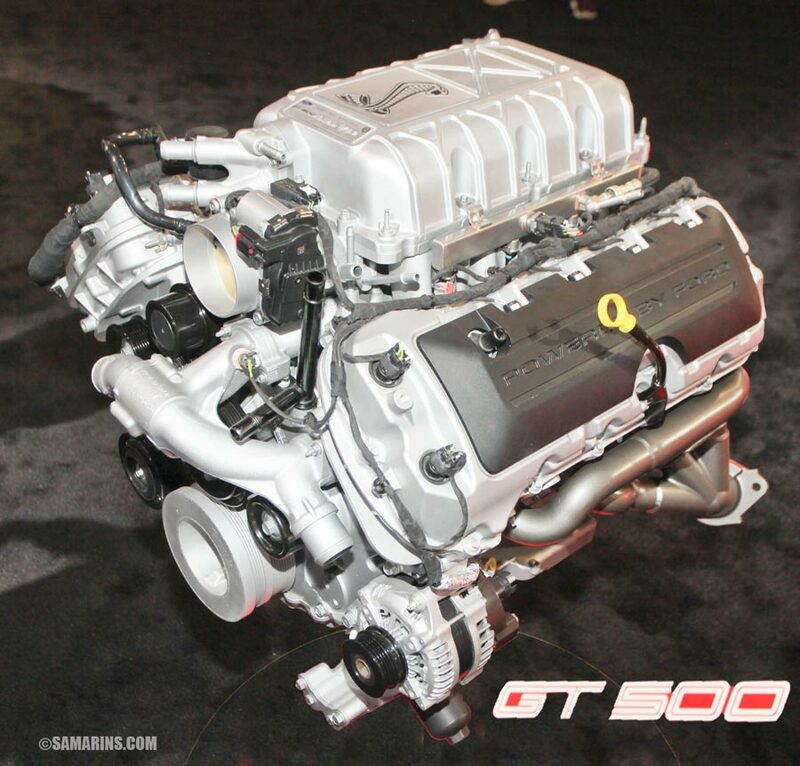 The Corvette's supercharged aluminum 650-hp OHV LT4 engine offers crazy 650 lb-ft of torque at 3,600 rpm. See also how small is this cylinder block of the GM LSA V8 pushrod engine. Today, under pressure to make cars more efficient, you will only find an OHV engine in some trucks and V8-powered sports cars. 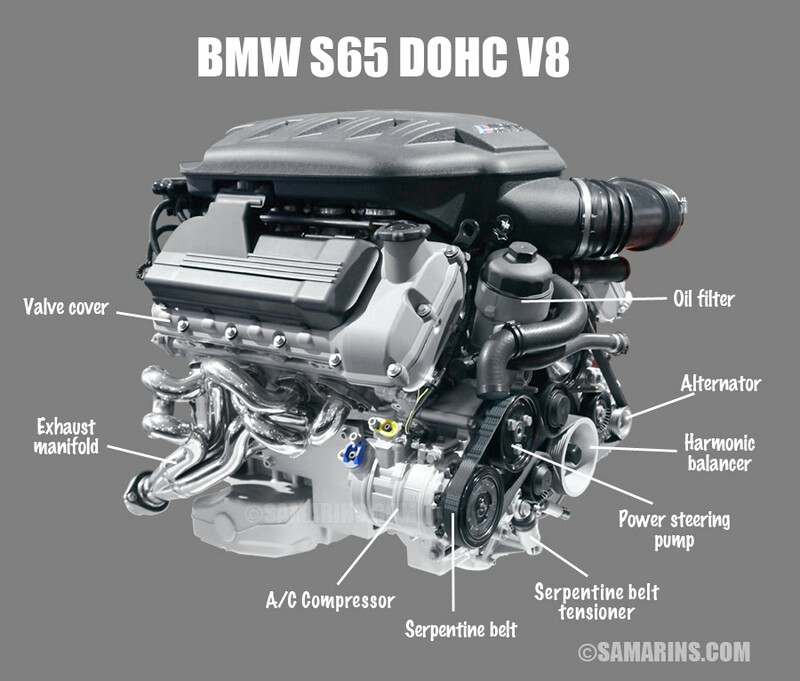 Modern 4-cylinder and V6 cars and SUVs have either OHC or DOHC engines. 2. 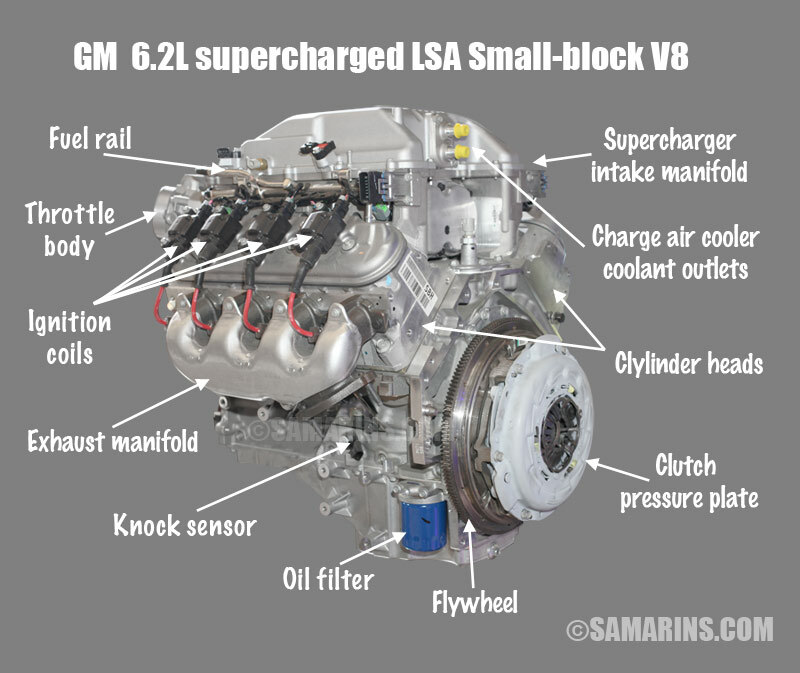 GM 6.2L LSA V8. OHC means OverHead Cam in general, while SOHC means Single OverHead Cam or Single Cam. 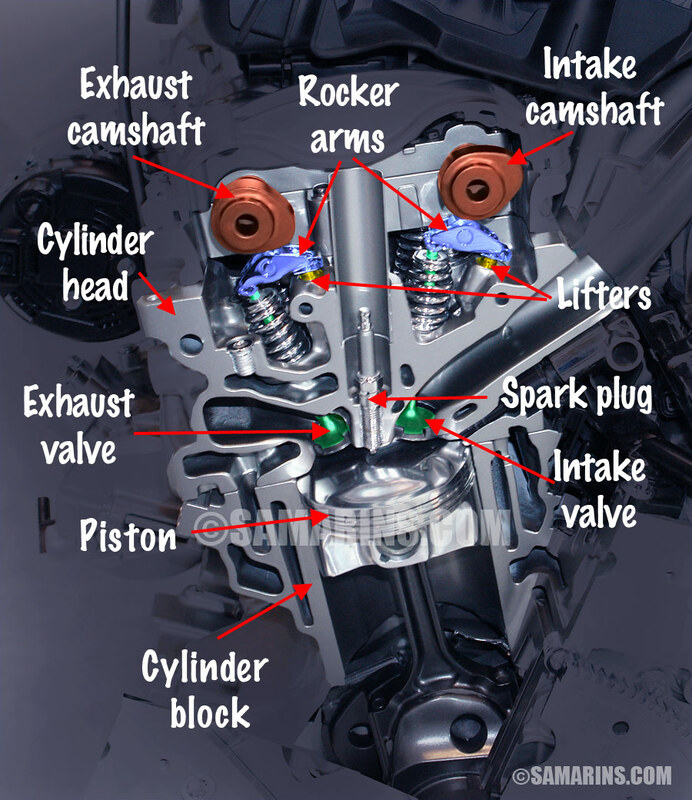 In a SOHC engine the camshaft is installed in the cylinder head, and valves are operated either by the rocker arms or directly through the lifters (as in this animation). See this photo of a Mitsubishi SOHC engine. The main advantage of an OHC design is that valves are operated almost directly by the camshaft, which makes it easier to maintain precise timing at higher rpms. It's also possible to install three or four valves per cylinder. Honda successfully uses the SOHC design in its late V6 engines where four valves per cylinder are operated by a single camshaft. Fiat uses a single camshaft and four valves per cylinder in its MultiAir engine, see this illustration of the Fiat MultiAir SOHC engine components. 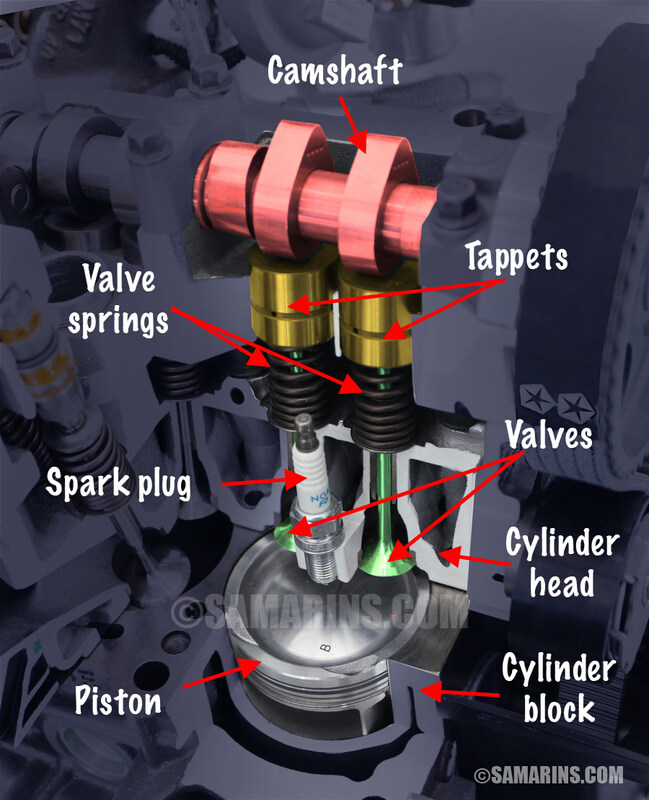 In this engine, two exhaust valve are operated by the camshaft through the tappets, while the two intake valves are operated by oil pressure. The downside of a SOHC engine is that it requires a timing belt or chain with related components, such as a tensioner and guides to run the camshaft(s). 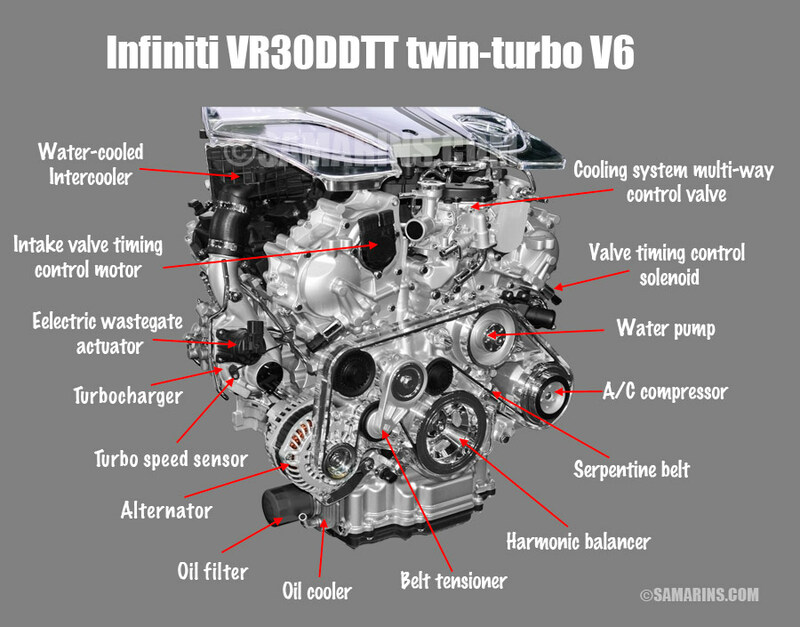 Another downside is that it's difficult to implement Variable Valve Timing separately for exhaust and intake valves; something that can be easily done in a DOHC engine. 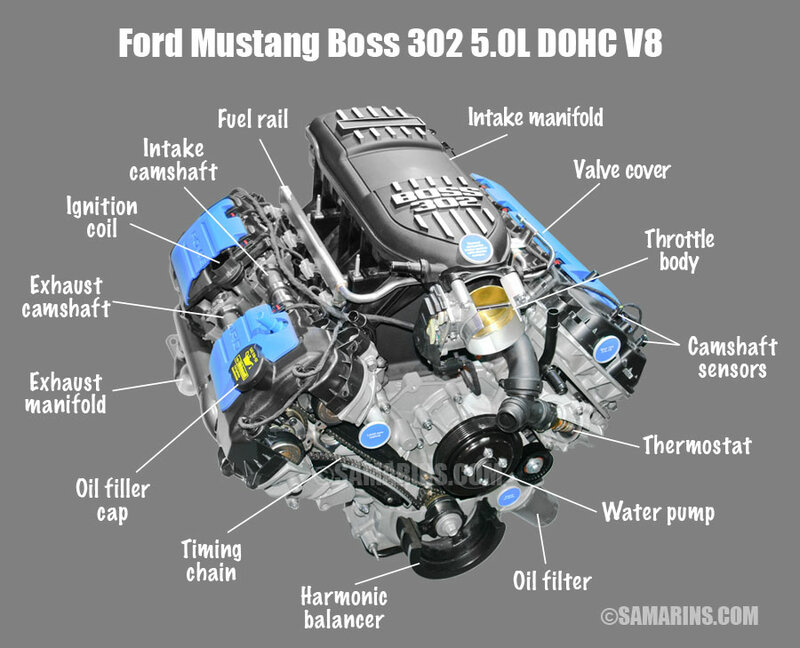 DOHC means Double OverHead Cam, or sometimes it could be called Twin Cam or Double Cam. Most modern cars have DOHC engines. A typical DOHC engine has two camshafts and four valves per cylinder, like the one in this animation. One camshaft operates intake valves (in the front), while another camshaft controls exhaust valves on the opposite side. 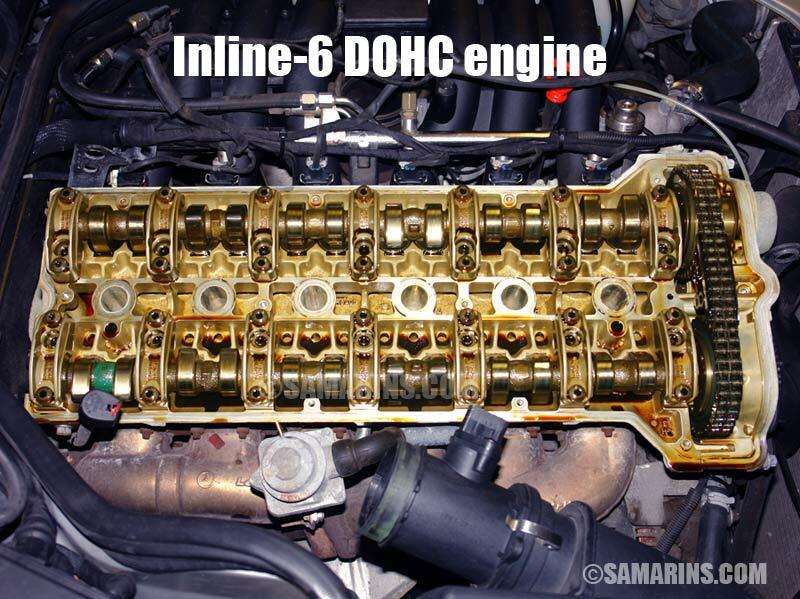 See the illustration of DOHC engine components. 6. Mercedes-Benz Inline-6 DOHC engine. In a DOHC engine, camshafts can be installed farther apart from each other. This allows the intake valves to be at a larger angle from the exhaust valves, which results in a more direct air flow through the engine with less obstruction. 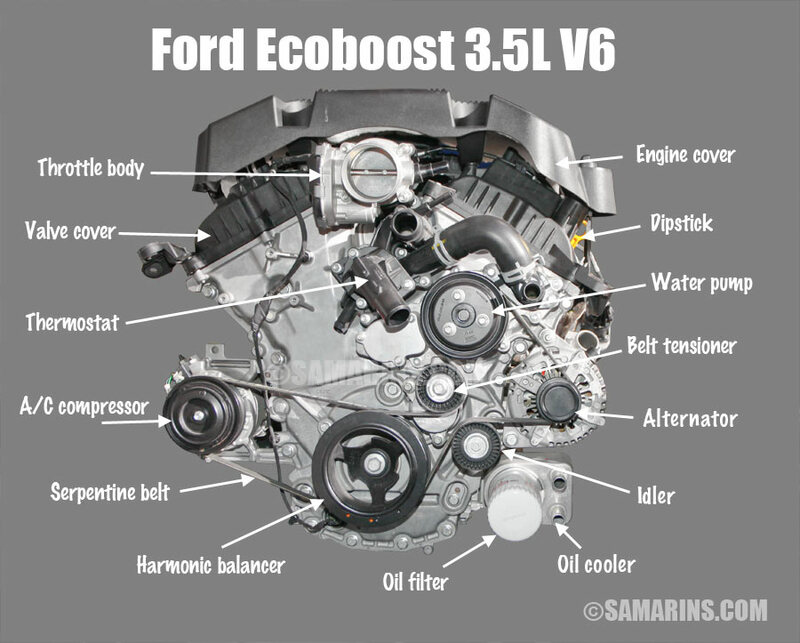 In other words, a DOHC engine can "breathe" better, which means it can produce more horsepower out of the save volume than a larger OHV engine. Compare: The 5.0-Liter V8 DOHC Coyote engine with 4 valves per cylinder of the 2018 Ford Mustang GT is rated at 460 hp @ 7,000 rpm. 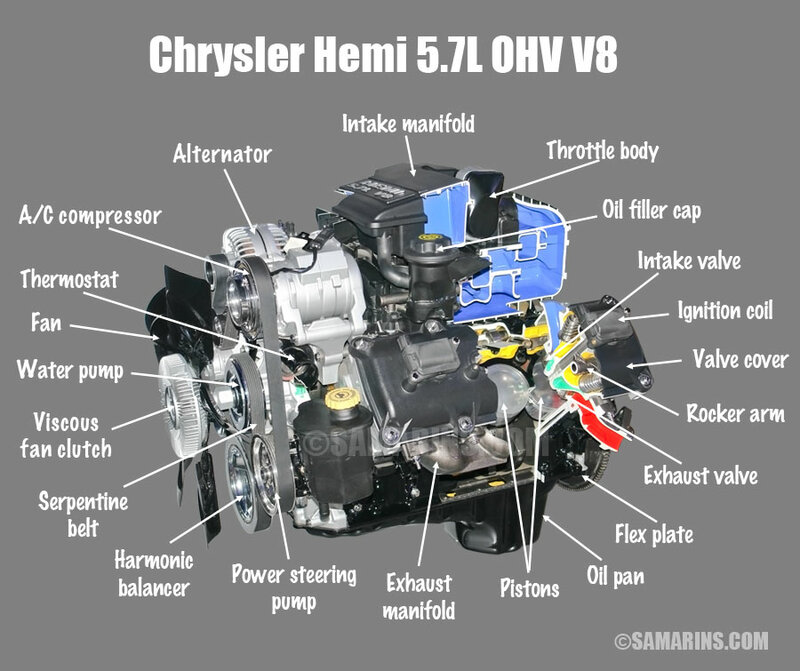 The 6.2-Liter OHV (pushrod) V8 GM L86 engine has two valves per cylinder and produces 420 horsepower at 5,600 rpm. 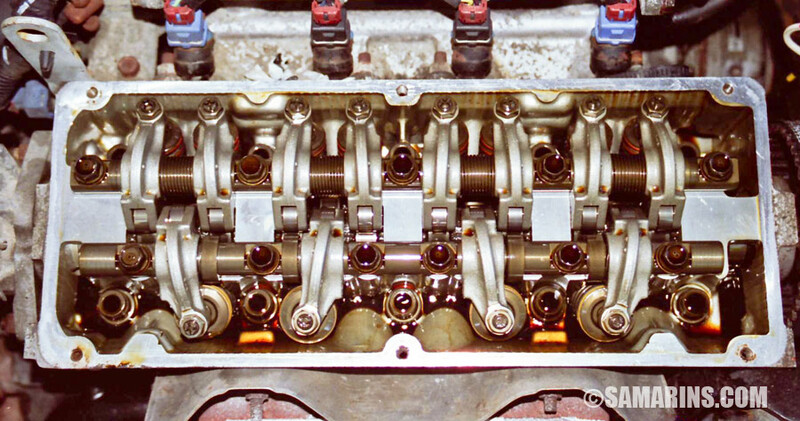 Technologies like Variable Valve Timing and Variable Valve Lift can be easily implemented in a DOHC engine on both camshafts, further improving the efficiency. Downsides of the DOHC technology include a larger size and more complex design with timing belt or chain components. A timing belt needs to be replaced at recommended intervals, adding to maintenance costs. Conclusion: Currently, the DOHC engine design is the most efficient, because it allows more power and at the same time, better fuel economy. For example, the 2019 Nissan GT-R offers 565 horsepower out of a 3.8L DOHC V6; something not every V8 engine can beat. Another example, the 2019 Toyota Camry delivers class-leading fuel economy (29/41 MPG) using a 2.5-Liter 4-Cylinder DOHC engine.